As the industry standard in professional layout and design, InDesign delivers powerful publishing solutions for magazine, newspaper, and other publishing fields. This introductory book is an easy-to-understand reference for anyone migrating from another software application or those with little-to-no desktop publishing experience. You’ll explore InDesign basics and examine the enhancements to InDesign CS5, while you also discover how pages work, build templates, create frames and shapes, manage styles, and much more. 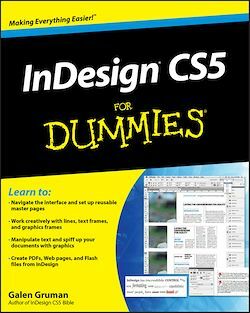 InDesign CS5 For Dummies offers a straightforward but fun approach to discovering how to get the most from your desktop publishing experience when using InDesign.